Clowns are the third most sought after Halloween costume of 2017. 1 With this in mind, the BURGER KING ® brand is hosting Scary Clown Night. Clowns are the third most sought after Halloween costume of 2017. 1 With this in mind, the BURGER KING ® brand is hosting Scary Clown Night. This Halloween, select BURGER KING ® restaurants in Boston, Massachusetts; Miami, Florida; Los Angeles, California; Austin, Texas and Salt Lake City, Utah will be full of frightening clowns eating flame grilled WHOPPER® sandwiches and Halloween will never be the same*. To participate on October 31, thrill seekers can visit the select BURGER KING ® restaurants listed below dressed as a clown from 7pm to close to claim their free WHOPPER ® sandwich. * But you'll need to hurry - the offer is limited to the first 500 guests wearing a clown costume only. 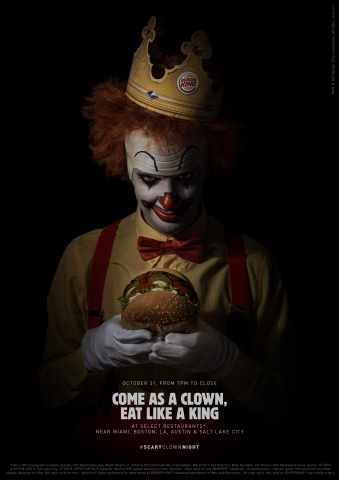 "We don't usually talk about clowns," said Alex Macedo, President, North America, for the BURGER KING® brand. "But for this Halloween, come dressed as a clown to eat like a king." The Scary Clown Night video can be viewed at Youtube.com/BurgerKing. Guests are encouraged to post their scary clown costume and tag @BurgerKing with #ScaryClownNight. OFFER DETAILS: Valid for the first 500 guests wearing a clown costume. Offer valid for one WHOPPER® Sandwich, no substitutions. One per guest. Not valid with any other coupon, discount or offer. Not valid on drive-thru. This offer redeemable only at the limited restaurants in Boston, Massachusetts; Miami, Florida; Los Angeles, California; Austin, Texas and Salt Lake City, Utah listed below. Validity of clown costume to be determined by BURGER KING® restaurant personnel in their sole discretion. Participation may vary by restaurant. Void where prohibited. No cash value. Not valid on BURGER KING® App mobile orders. TM & © 2017 Burger King Corporation. All rights reserved. Valid 7PM to close on 10/31/17. About BURGER KING ® Founded in 1954, the BURGER KING ® brand is the second largest fast food hamburger chain in the world. The original HOME OF THE WHOPPER ®, the BURGER KING ® system operates more than 15,000 locations in approximately 100 countries and U.S. territories. Almost 100 percent of BURGER KING ® restaurants are owned and operated by independent franchisees, many of them family-owned operations that have been in business for decades. The BURGER KING ® brand is owned by Restaurant Brands International Inc. (TSX,NYSE:QSR), one of the world's largest quick service restaurant companies with more than $27 billion in system-wide sales and over 23,000 restaurants in more than 100 countries and U.S. territories. To learn more about the BURGER KING ® brand, please visit the BURGER KING ® brand website at www.bk.com or follow us on Facebook and Twitter.